This week in Toastmasters, we had a fun day focused on the summer. As some of you know, there’s usually a word of the week (WOW) that we discuss and try to use when it’s our turn to talk. The word of this week was journey. Everyone did very well using that word, but what I found more interesting was this synonym for journey: peregrination. Peregrination means a journey, especially a long or meandering one. I’d never heard that word, but I had heard of peregrine falcons, and I wondered if there was some connection. Here’s what I found on my word expedition. Enjoy! 1590s, from Latin peregrinatus, past participle of peregrinari "to travel abroad, be alien," figuratively "to wander, roam, travel about," from peregrinus "from foreign parts, foreigner," from peregre (adv.) "abroad," properly "from abroad, found outside Roman territory," from per "away" (see per) + agri, locative of ager "field, territory, land, country" (from PIE root *agro- "field"). *agro- Proto-Indo-European root meaning "field;" probably a derivative of root *ag- "to drive, draw out or forth, move." It forms all or part of: acorn; acre; agrarian; agriculture; agriology; agro-; agronomy; onager; peregrinate; peregrination; peregrine; pilgrim; stavesacre. It is the hypothetical source of/evidence for its existence is provided by: Sanskrit ajras "plain, open country," Greek agros "field," Latin ager (genitive agri) "a field," Gothic akrs, Old English æcer "field." also peregrin, type of falcon, 1550s, short for peregrine falcon (late 14c. ), from Old French faulcon pelerin (mid-13c. ), from Medieval Latin falco peregrinus, from Latin peregrinus "coming from foreign parts," from peregre (adv.) "abroad," properly "from abroad, found outside Roman territory," from per "away" (see per) + agri, locative of ager "field, territory, land, country" (from PIE root *agro- "field"). Sense may have been a bird "caught in transit," as opposed to one taken from the nest. 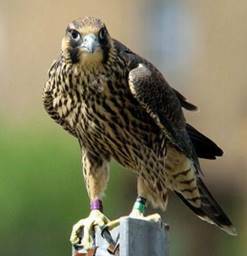 Peregrine as an adjective in English meaning "not native, foreign" is attested from 1520s.